The temporary skills visa system has played a key role in developing Australia's capabilities in a short time period. The system has also played a vital role in ensuring there is not a shortage of key maritime personnel in Australia thereby enabling the effective working of our ports and some of our shipping routes. Australia is not only in our search for highly qualified and experienced maritime personnel. The International Chamber of Shipping indicates the current supply demand situation of maritime labour highlights a shortage of approximately 16,500 shipping Officers globally. the lack of long-term planning of the maritime labour market in Australia by Governments. The ability of the temporary skilled visa system to limit this forecast maritime skills shortfall is key to operational continuity at Australian Ports. It will provide security of ongoing operations in all our ports (especially regional), ensure training is provided to junior Australian staff by qualified personnel and secure international personnel who have acquired local knowledge when the current aging workforce retires. 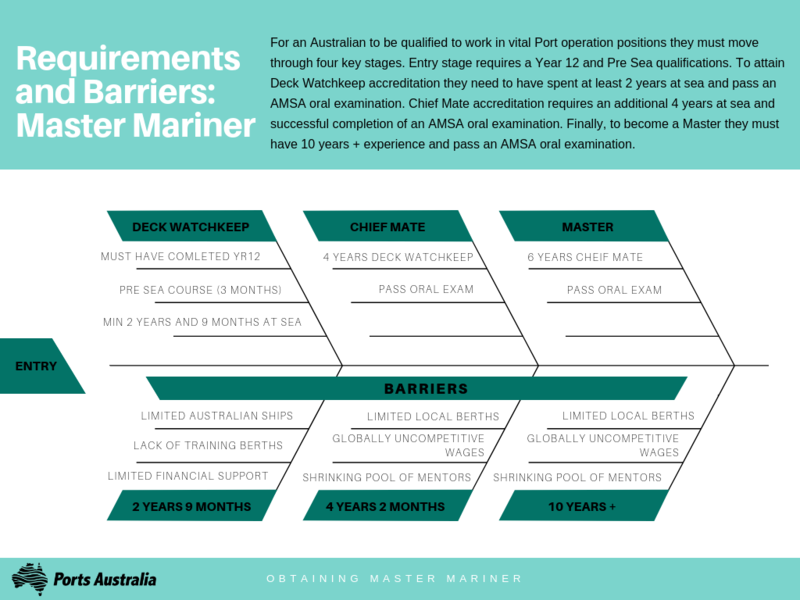 The current labour market testing arrangements did not identify the long-term skills impact in the maritime industry when the decision was taken in 2017 to omit specialist maritime roles, such as Harbour Masters, from the Skilled Occupations List. It takes significant education and experience to reach these positions as illustrated below, and these personnel play an essential role in mentoring local staff to graduate and reduce our reliance on international maritime experts.